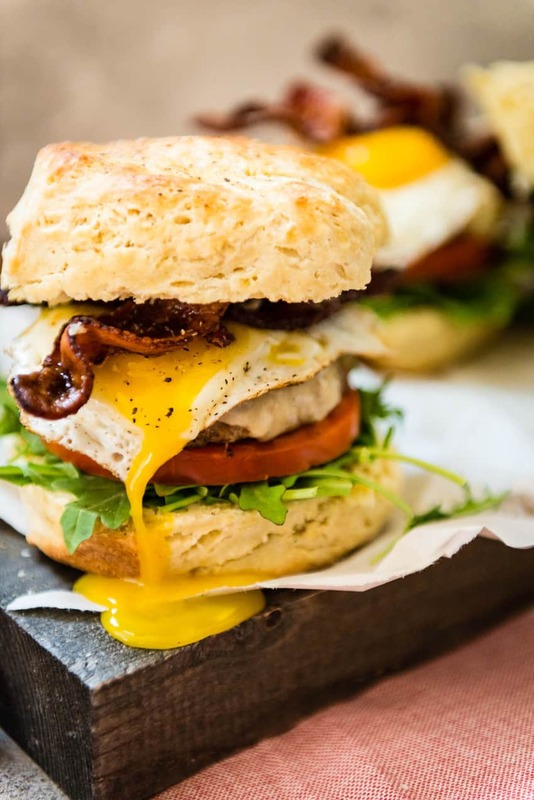 Thick flakey black pepper biscuits, hand tapped organic maple syrup, Vermont cheddar cheese, local eggs and of course, black pepper bacon all with a maple aioli. 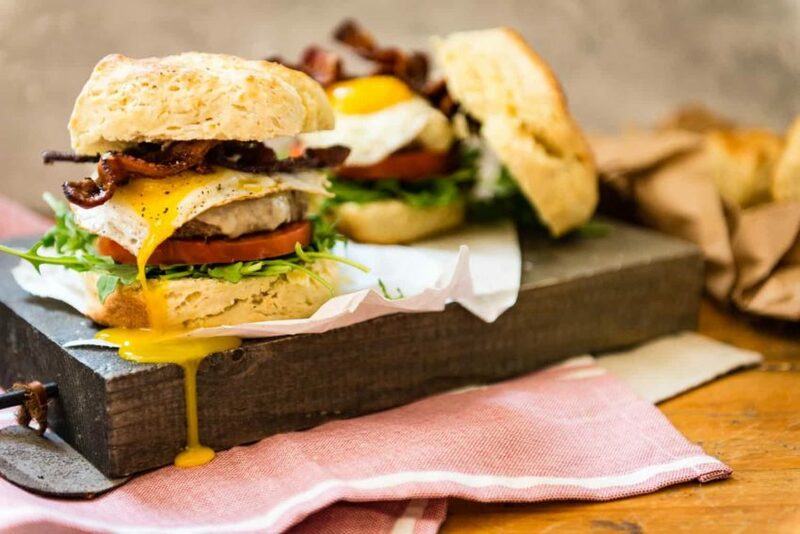 This is the New England Maple Brunch Burger. This post was sponsored by Coombs Family Farms, however, the dreamy chicken and waffles were totally inspired by their syrup and the recipe, opinions and what-nots are all, as always, my own. We get it America. Burgers. They are bigger and more extream every single day. There are mountains of patties slathered in buckets of cheese with toppings so out of this world, they are a meal in themselves. And don’t you worry, we are fans. Every day, thousands of new Instagram worthy burgers hit social media across the country. We sit, drooling, staring at our phones wondering if we can sneak one in before the next cycle session or perhaps, after yoga. 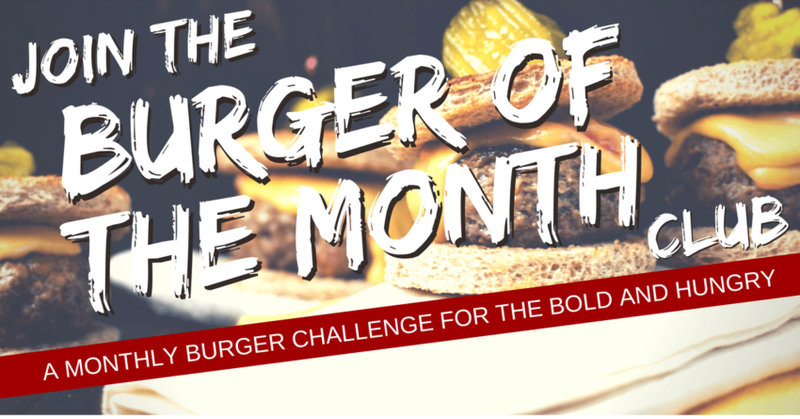 This judgment-free zone has no boundaries when it comes to burgers. But, when’s the last time we considered using regular everyday ingredients on our burgers? Staples of our own kitchens and regional flavors to elevate our personal culinary kudos to the next level. True story, I just recently moved to New England. What do I know about New England? It’s bloody cold. And they love syrup. And cheese. And Subarus. That’s my knowledge in a nutshell. 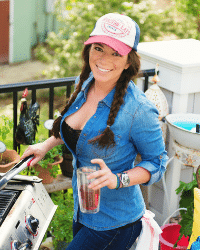 But on my drive, while dreaming about, you guessed it, burgers, I pass several flags in front of country stores advertising the best local maple syrup, local produce, fresh eggs, and local pork. All of that seems like a winning combo to me. Use the highest quality, freshest ingredients to build a better burger. 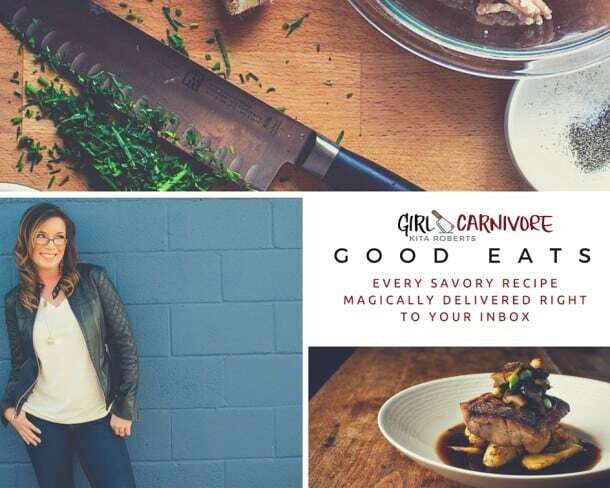 Now that, this Girl Carnivore can do. Starting with the biscuits, I used Grade A organic maple syrup from Coombs Family Farms. I worked in local flavors on every level. Local pork for the patties, fresh eggs, thick Cabot cheddar on top and all of it with a spicy black pepper kick. 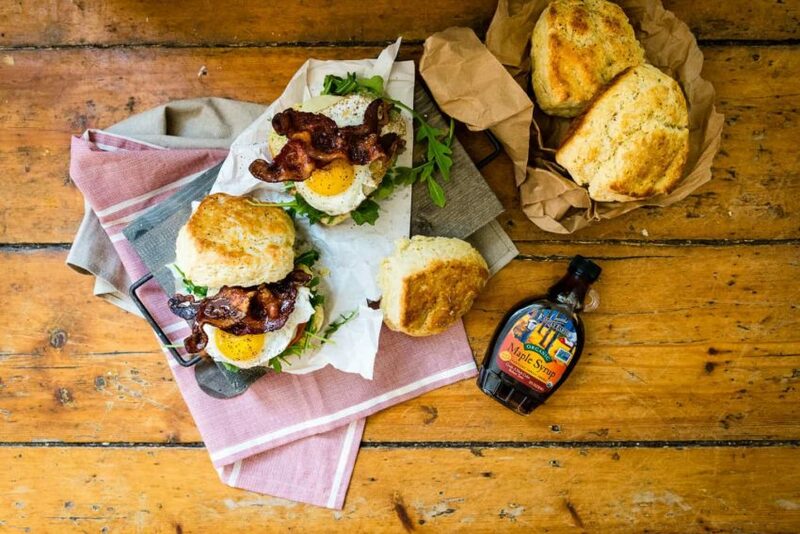 Pop over to my ode to chicken and waffles to read more about just what makes Vermont organic Maple Syrup some of the best and then check out the Coomb’s website to see where you can pick up a bottle yourself. Sure, it was still a bit over the top Instagram worthy burger. I may have gotten carried away when I doubled the biscuit recipe and made them the size of salad plates. 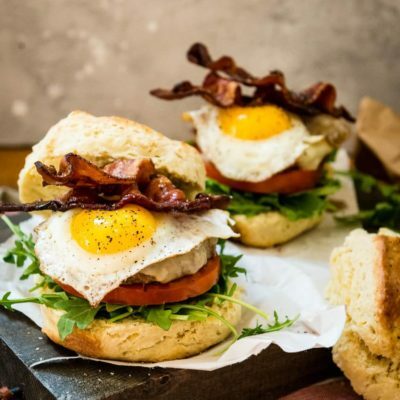 But, if you can curb that, and go for portion control, these New England Maple Brunch Burgers are something all aspiring burger chefs can whip up without stretching too far out of the standard kitchen stock. Pro Tip: Real maple syrup should be stored in the refrigerator after opening for the best shelf life and food safety. Heat in a small pan before use. Side note, if you are NOT in the New England region, this may be a stretch for you. But it’s worth hunting out the ingredients and trying the real deal. There’s syrup and then there’s hand tapped organic maple syrup from a sugarhouse in Vermont. There’s cheese, and then there’s Vermont cheddar. Grate 12 tablespoons butter for the biscuits. In the bowl of your stand mixer, whisk the flour, baking powder, salt, 1 tablespoon plus 1 teas black pepper, and sugar. With your fingers, work the butter into the dough to coat. Mash the egg yolks with a fork and add them to the flour mix, tossing everything together. Using the mixer, slowly add in the buttermilk until the dough forms a tacky ball. On a clean floured work surface, roll the dough together with your hands. Cover with plastic wrap and let sit for 1 hour in the fridge. Meanwhile, preheat the oven to 400. When ready to cook, shape the dough into a large round about 1 1/2" thick. Slice or cut into 4 large biscuits. Place into a greased cast iron pan, or onto a parchment lined baking sheet. Melt the remaining 4 tablespoons butter and brush over the tops of the biscuits. Sprinkle a bit of kosher salt and the remaining black pepper over top. Slide into the oven and cook for 10 minutes. Reduce the heat to 375 and continue to cook another 15 - 18 minutes until the biscuits are golden and fluffy. Remove from heat and cool a few minutes before handling. Keep the oven on for the bacon. In a small bowl, whisk the mayo, syrup, black pepper and salt together. Set aside. In a large bowl, mix the pork, minced garlic, salt, pepper, ground sage, thyme, and red pepper flakes together until combined. Form the mix into 4 large patties. Press the center of each patty with a thumb to form a dimple (this helps from keeping your patties from expanding too much while cooking). Heat a large griddle or 2 cast iron skillets over medium heat. Cook the patties, without moving, until a nice crust forms. Flip and cook through to a temp of 160 for ground pork. Set aside to rest and lay a slice of Vermont Cheddar over each to melt. Meanwhile, cook the bacon in the oven by arranging the strips into a single layer on a baking sheet. Bake until crispy, 15-18 minutes. Remove from oven and brush with a hint of syrup to paper towel lined racks to dry. Fry the eggs on the hot griddle cook tops when ready to serve. Assemble the burgers by coating the biscuits with the maple aioli. 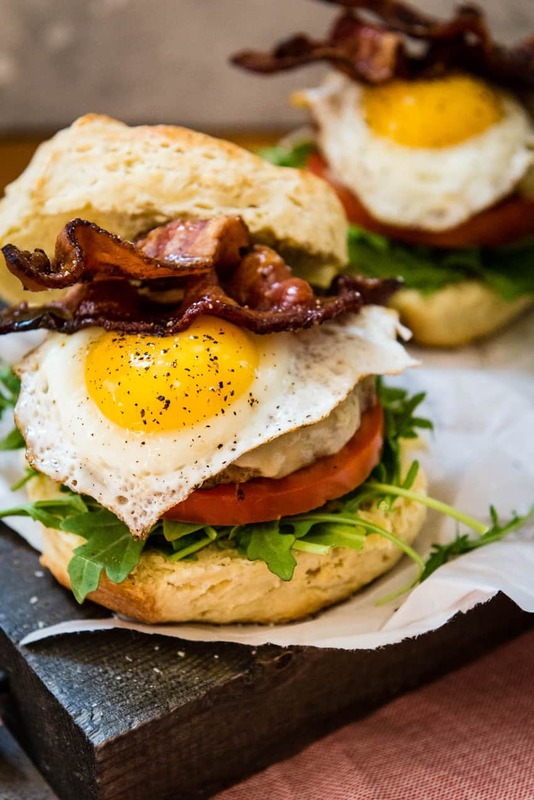 Layer the arugula, tomato, pork patties, fried eggs and bacon on top. Serve open-faced if using full giant biscuits or make smaller biscuits and enjoy as proper burgers. OMG you put a burger on a biscuit. I’m in LOVE! I am wishing it was time for brunch! This looks so good! All those goodies on a burger in a biscuit!